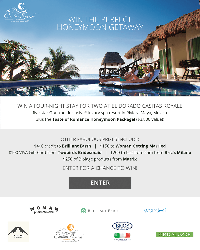 Prize: 4 nights @ the El Dorado Casitas Royale, + all meals, drinks; $400 credit to Brilliant Earth, 2. $150 to Woman Getting Married, 3. $100 VISA Gift Card from Twobirds Bridesmaid, 4. $200 to bricstore.com ($4,900). no air. Statistics: This contest was opened by 23 and entered by 2 ContestChest.com members. 9% of those who opened the contest, entered it.